After weeks of cold weather and a sinus infection that wouldn’t quit, I was so happy to see the sun come out and temperatures to rise above 50 degrees this week! My husband had been putting together hive bodies while I slept the previous weekend away, and they were stacked up in the garage just waiting to be painted. I arrived home Tuesday and grabbed the paint can with the green dot on the lid and headed out to start painting. The green dot and label lied — the paint was actually the interior paint we are using in the living room, but I used it anyway. A lack of exterior paint was not going to send me back indoors! I painted a couple of boxes with that and a couple with some ancient paint I used in the upstairs bathroom after our youngest daughter moved out after high school. (She’s since completed her degree and has been working for two years, so the paint is old! It was also the consistency of old milk, but it served as a primer.) On Wednesday I stopped at Wal-Mart then Lowe’s and purchased some pistachio spray paint, and yellow and almond paint. I’m not very good with spray paint, so the pistachio also ended up being a primer. 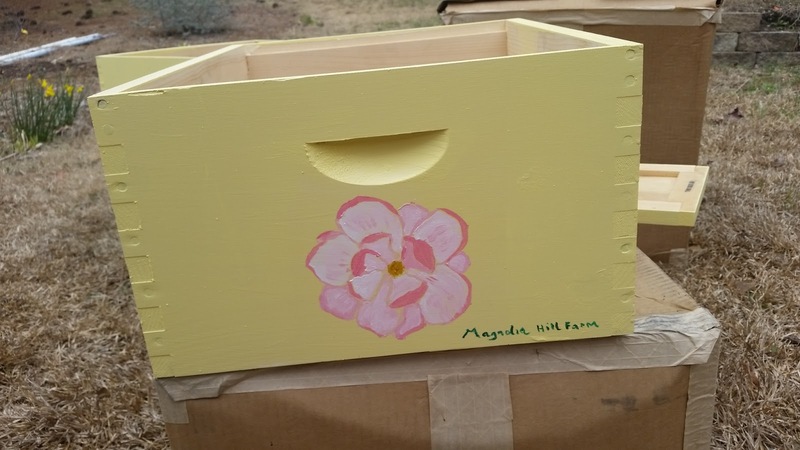 But, I am well on the way to having a quart of paint’s worth of yellow bee boxes. I found two sketches of magnolias I like, and used the line drawing one with transfer paper with minimal success to decorate one box. I haven’t been able to find a stencil I liked, so I decided to make my own stencil. I also decided to try wood burning. As luck would have it, the wood burning tool I bought on Friday comes with a tip designed for cutting out stencils and it worked for the first one. I ended up hurrying the second one and melted holes all over the plastic with the barrel of the tool, so I’ll revisit that in a few days when my patience level has refilled a little! I know I won’t have time to decorate every box, especially as hubby is on the way back from Georgia with a trailer full of boxes that need to be cleaned and painted in addition to the new ones still waiting in the garage. I figure I’ll girlify a few at a time. All of our current boxes are painted with a baby blue paint that is the result of mixing lots of left-over cans in a big bucket, so a few splashes of color here and there will at least be a break in the monotony! I hope it doesn’t rain tomorrow and I also hope it does rain. 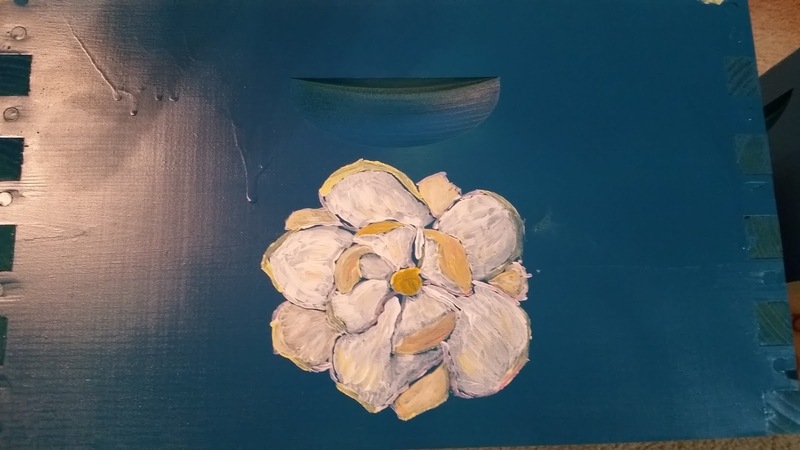 I still have 40 essays to grade before Monday morning, and painting magnolias is just so much more fun! Somehow I just have to find a balance between getting my students the feedback they need and indulging in the creativity that gives me the mental strength to keep teaching literary analysis and writing! Next Post One Bee of a Headache!